Whether you build the fastest car, zap trolls and spiders with lasers or see a miniature Kansas City made out of LEGO® bricks, there’s plenty of fun to be had at LEGOLAND® Discovery Center Kansas City. This admission ticket grants each LEGO-loving child access to multiple family-friendly attractions. 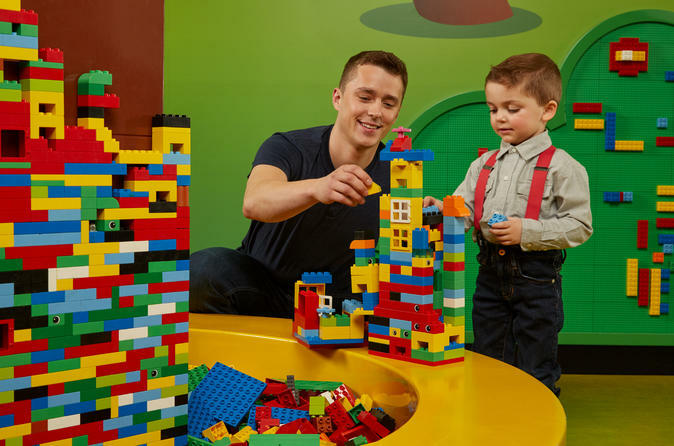 Little ones can build with large, soft bricks in the DUPLO® Village, and all ages can take a break and watch their favorite characters at the 4D Cinema. Located at Crown Center in Kansas City, LEGOLAND Discovery Center offers a world of fun for children ages 3-10. With this admission ticket, you'll have access to plenty of entertaining attractions to keep the whole family busy for a day of LEGO-building fun. A typical visit usually lasts two to three hours, but you can stay as long as you like. Perhaps start with a visit to the LEGO Factory, where Professor Brick-a-Brack shares how LEGO bricks get their shapes and colors. Make your way to Miniland, and watch as night falls and the lights come up over buildings, airships and trains made of nearly 1.5 million LEGOs. Or, since you are almost in Kansas, indulge in The Wizard of Oz fun by traveling from Dorothy’s Farm over the rainbow to Munchkin Land, and then end your journey in the Emerald City. Construct a LEGO building at the Earthquake Tables, and then watch as plates move to test the strength of each tower. At LEGO Racers, there are thousands of bricks to build and test your own race car, and at the farmyard-inspired DUPLO Village, younger kids can play with large soft bricks. Amp up the adventure aboard a mighty chariot on the Kingdom Quest Laser Ride, using mounted laser guns to zap trolls and spiders as they appear around each corner. Or, become a top wizarding student by pedaling a bike as fast as you can to help create a magic potion on Merlin’s Apprentice Ride. Perhaps build your own microphone and perform on a karaoke stage with LEGO Friends, or use your imagination to create a mural at the LEGO Art Gallery. LEGO Fire Academy and LEGO Construction Site play zones provide more fun. Kids can also learn building tips and tricks by attending a class at the Master Builder Academy, where instructors take them through a Minibuild (additional fee). Please note: LEGOLAND Discovery Center Kansas City is a children's attraction; to promote a safe and family-friendly environment, adults cannot enter without being accompanied by a child.